Here I sit, choking down what might be the world's worst coffee. SH thinks I use too much coffee when I make it, so today I used less. The result was coffee flavored water. YUCK! At least breakfast was yummy. 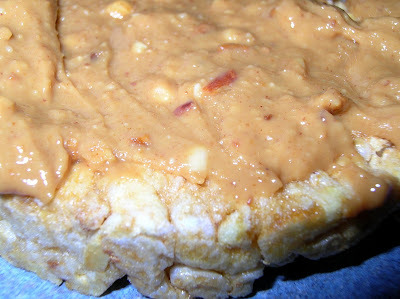 I can never go wrong with a rice cake spread with peanut butter. Smucker's crunchy is sooooo good. Food styling and photography are not my forte. For the past two weeks, Walmart has been out of creamy. I suspect that SH and BG think I have been lying, as they prefer creamy. When we aren't spreading peanut butter on rice cakes, we are eating beans. Bean spreads are better served on bread or crackers. Rinse the gucky stuff from the canned beans and drain. Chill and then spread on bread or crackers. can and a 15 oz can of beans, I checked in my pantry. The can of kidney beans that I have is 15.5 oz. Add a bit of water if too thick. For more of the outdoors, visit Outdoor Wednesday. of my dead winter yard. Yuck. 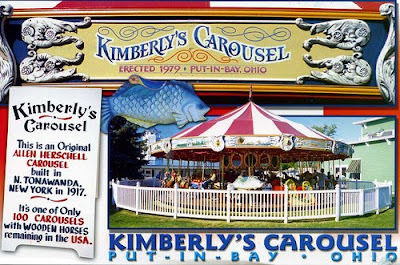 I could not place Kimberly's Carousel. I figured that BG would remember. She inherited my father's photographic memory. So did my younger sister. What did the genetic genies give me, you may ask. Thinning hair comes to mind! 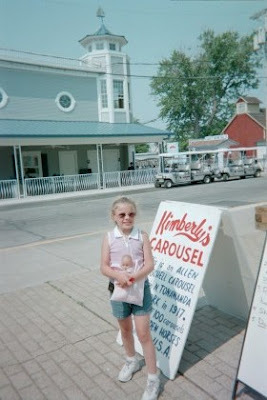 locate the carousel, I found links to other places we had visited. but can't quite place. Yes, there is a lesson in there. Mix and pour over the dry mixture. Chil at least 30 minutes before serving. This recipe makes the type of pudding that is cut in squares, not the mooshy bowl served variety. I watched the Frugal Gourmet make it on a TV show, many years ago. He added 1/4 cup of brandy. I have never tried that, simply because I don't want to buy a bottle of brandy to use for one recipe. My friend, Jenny, gave me this cute bowl. Poor into an 8x8 inch square pan. or until a knife inserted in the middle comes out clean. Roughly chop as many apples as you desire. We used unpeeled Granny Smiths and one Gala. The peels get very soft when cooked, but if they bother you, peel the apples. Fill the crock pot with apples. Sprinkle with a bit of lemon juice. Mix to coat the apples. Sugar can be added, but we don't use it. Ours was ready in 3 hours. Perfect to serve with potato pancakes. We did not make any potato pancakes. We ate it nine days old. Just making sure you are paying attention. It was very, very yummy. At least I thought so. BG did not agree She sent me an email, just in case I didn't understand the signs for "Yuck, why did I bother chopping apples, when I could have been texting friends?" Sorry, I don't like that applesauce. It taste not tasty. I like Mott's applesauce. I do not like what we made. Make at your own risk! To me, this was the best applesauce I have ever tasted. I will not return to making applesauce on the stove.